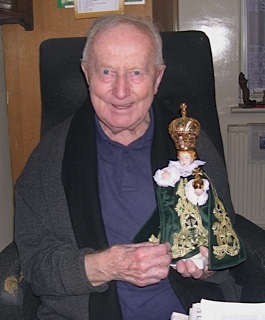 FATHER LANG, “ONE OF THE PUREST SOULS I HAVE EVER MET” writes one member, Jarmila Karas. In the memories of many he remains a man of God; loving, tolerant, energetic, sensitive to the needs of others, a man with a large and open heart, and a tireless fighter against the Communist regime…. Jan Lang was born on June 20, 1919 in Rajhrad u Brna, where he was also baptised. At the instigation of Abbot Hlobil of Rajhrad, he enrolled at the Velehrad Jesuit School to become a priest. After six years of study at Velehrad and two years at the Episcopal Grammar School in Prague, he enrolled on September 8, 1938 at the Jesuit novitiate in Benešov and by 1940 he had served his first regency. From 1940-42 he studied in Benešov and following the seizure of the local college by the Nazis he transferred to Velehrad, where he studied philosophy. In 1943-44 he continued his study of theology at the Strahov monastery in Prague. In the summer of 1944 Lang and other students were arrested and he remained imprisoned in the Pankrác jail until February 1945. From there he was transported to the Small Fortress in Terezín, where he contracted typhus, but miraculously survived. In September 1945 he left for Great Britain to complete his theology studies at the Jesuit Heythrop College. On September 8, 1947 he was ordained a priest and in 1948-49 he underwent Tertianship at the St. Beuno’s spirituality centre in Wales. He pronounced his Final Vows on February 2, 1956 in London. While preparing for his mission as a Catholic priest in his native Czechoslovakia, where he planned to return after his ordination, the situation suddenly worsened. The February revolution found him still in England, and when the first refugees began pouring into London, he helped them as best he could. Providing assistance to his countrymen abroad thus became Father Lang’s lifelong mission. In the memories of many he remains a man of God; loving, tolerant, energetic, sensitive to the needs of others, a man with a large and open heart, and a tireless fighter against the Communist regime. Since 1949 he has worked in Czechoslovak missions, at Catholic events and in schools, which he founded. 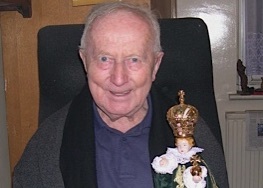 For more than 40 years he presented Czech religious discourses on BBC radio and in 1949 his initiatives led to the introduction of regular church services for Czechs and Slovaks at the Jesuit home in Farm Street, where he also resided since 1954. He collaborated in the publication of a Journal with the Cyril and Methodius League, which after several editions was renamed New Life and since 1954 was published as a religious periodical for Czech and Slovak expatriates in Rome. Father Lang has significantly contributed to the activity of Czechoslovak emigration in London and to the establishment of the London branch of the Committee for the Defence of the Unjustly Persecuted, which published printed materials and organised protests in support of Czechoslovak political prisoners. He stood at the birth of the Naarden Movement (1968), which fought for human rights, and spearheaded the initiative to build a monument to Jan Palach in London. For his work on behalf of the Czechoslovak expatriate community in Britain and his support of Czechoslovak dissidents, in 1991 President Václav Havel awarded him with the Order of Tomáš Garrigue Masaryk. Much of Father Lang’s efforts were directed at the establishment of the Velehrad religious, cultural and social centre, which opened in London in 1964. He even contributed money that he received from the German government as compensation for his imprisonment in Terezín. Velehrad served as a religious and cultural centre and gradually transformed from an asylum for people in need into a pleasant place for Czech and Slovak nationals to meet. A lively community was formed here, in which people could exchange their experiences and help each other solve problems. Many even found their life partner here. Velehrad also had a Sunday school and choir. There were lectures, social events and meetings with cultural organisations, for example the Association for Science and Art. Father Lang succeeded in creating an extraordinarily welcoming and friendly atmosphere, from which visitors to the centre derive human and spiritual energy to this day. Towards the end of his life, Father Lang entrusted the leadership of the centre to his colleagues in the Management Board of the charity – the Trustees (who have legal ownership of the building), but he still came to Velehrad daily. On February 7, 2007 he was taken to St. Mary´s Hospital in Paddington, where on the morning of March 21, 2007 he died. In the memories of many he remains a man of God; loving, tolerant, energetic, sensitive to the needs of others, a man with a large and open heart, and a tireless fighter against the Communist regime.